Does Columbus have any ‘real’ Chinese food? This question finds its way to us with increasing frequency, both online and in person, from dismissive newcomers to Central Ohio as well as jaded locals. We have plenty to say about it, but first, lets talk about this idea of what’s ‘real’. ‘Real’, in this context, is almost always used as a synonym for ‘authentic’. To the extent that anyone has the authority to categorize any Chinese food as authentic, it certainly isn’t us. What we can do, though – with a little help from our friends – is to distinguish the restaurants that are cooking menu items for the Chinese palate from those that are not. In other words, while we’re not fools enough to believe that we can measure any given restaurant’s success in maintaining absolute fidelity to Chinese culinary tradition, we do believe that our merry band of grazers can discern the intent to appeal to a Chinese audience. And, we can share our thoughts on what we enjoy. OK, so back to the original question. We have to admit that it evokes a mild sense of indignation in us, as we’ve been enjoying the fruits of many of the city’s delicious Chinese kitchens for years – often with Chinese dining companions – and have felt some measure of pride in the range of options available to a city of our size. I mean, ‘Are there any?’ Of course! How many? Time to make a list. This was a process full of surprises. Once we made our initial list, and then continued searching, we were astounded by how much it grew. There’s an awful lot out there, and far more than we’ve had the opportunity to experience. Sounds like a new food adventure to us! Over the next year, we’re going to visit/revisit each one of the restaurants on the list (linked below), and we’re going to try them with as many people as is practically possible so we can try as broad of a range of dishes as possible. We’ll post a brief accounting of each here, and hopefully put that pesky question to rest once and for all. Well, almost there. Please bear in mind that while we’re trying to be complete, we may not have caught everything. If we missed something let us know! Also, please understand that some of these restaurants will only have Chinese-American offerings shown on their website. You have to explore their broader menu in person to get the full story – which is exactly what we intend to do. After the full list (which also includes markets and bakeries), we’ve taken our first stab at categorizing restaurants by their specialties. This will be refined as our adventure progresses, but is intended to illustrate the breadth of regional and culinary specialization found among the city’s Chinese offerings. Early in 2013 we read that Luce had a new Japanese owner and was being rebranded as Luce Nuovo. 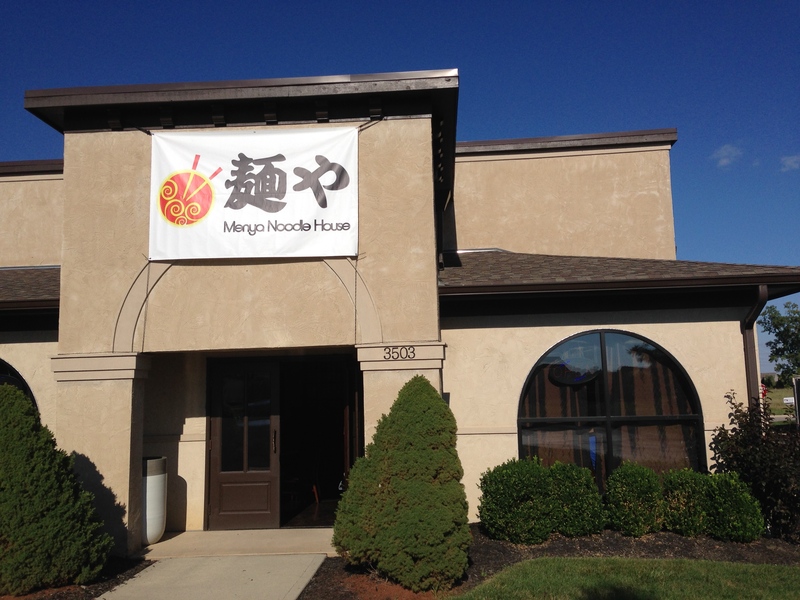 More recently, they’ve cordoned off a section of their restaurant (including a separate entrance) to open Menya Noodle House, a weekend-only ramen shop that debuted this weekend. Menya offers three ramen broths – shoyu, miso and tonkotsu. The miso had already sold out, so shoyu and tonkotsu it was for our group of 3. We unanimously prefered the tonkotsu (pork bone broth, pictured below). Nice and rich and meaty, we thought it to likely be the best tonkotsu broth in the city. The shoyu, by contrast, struck us as fairly average. The pork belly topping was sliced into long bacon-like strips. It was tender but otherwise indistinct, and a more traditional chashu would have been preferable. 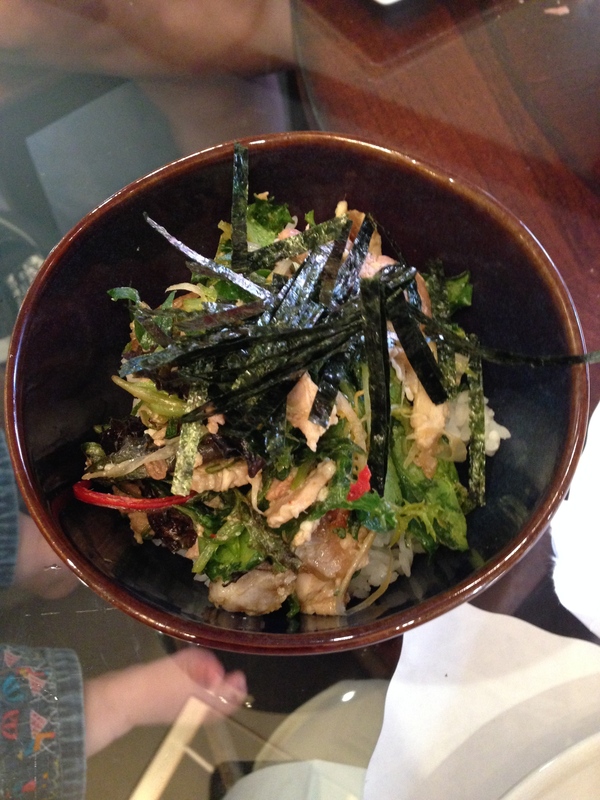 You can order extra seaweed, egg or pork belly toppings, though they were out of eggs on this visit. Both the ramens that we sampled were served with thin ramen noodles. 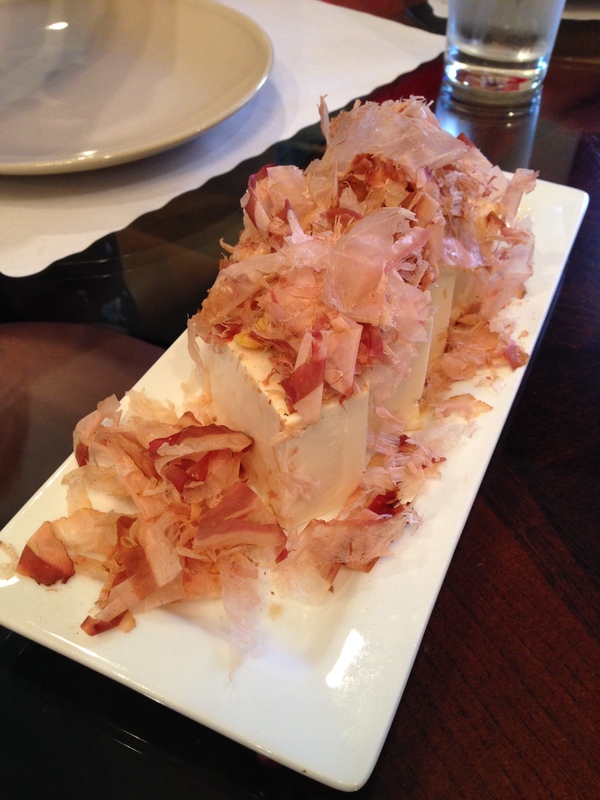 There is a small selection of appetizers, including cold tofu with ginger and bonito (best eaten with the provided soy sauce) , edamame, and several rice dishes. 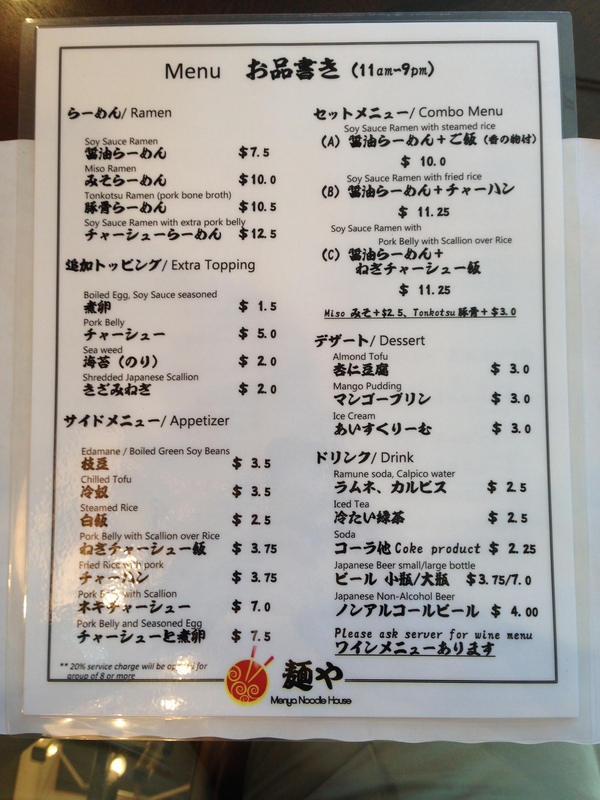 You can also order from Luce’s Italian offerings, printed on the back of the Japanese menu. For more on ramen in Columbus check out our article for Columbus Crave. 4720 Reed Road, near Reed and Henderson. Poong Mei Asian Bistro is the restaurant also/formerly known as Spring of China. The owners realized that the original name was misleading as their offerings span Chinese, Korean and Japanese, but the transition to a new name seems to be very gradual. We were told that Poong Mei means successful in Chinese, tasty in Korean and beautiful in Japanese and the owners thought that all of these were auspicious for their business. The menu is divided into Chinese/ Western, Chinese, Korean/Japanese and Korean and there are some interesting selections in each. Our interest was piqued by a rumor that they made their own noodles in house, which indeed they do – there is a whole page devoted to them. They also make their own dumplings from scratch. 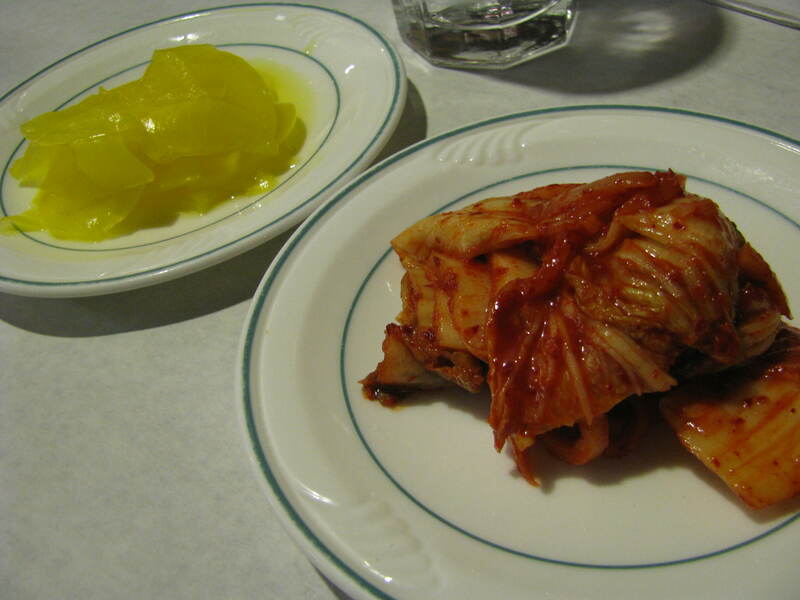 The restaurant has a little more of a Korean feel than Chinese, especially when we were presented with a banchan-like selection of kim chi and pickles. 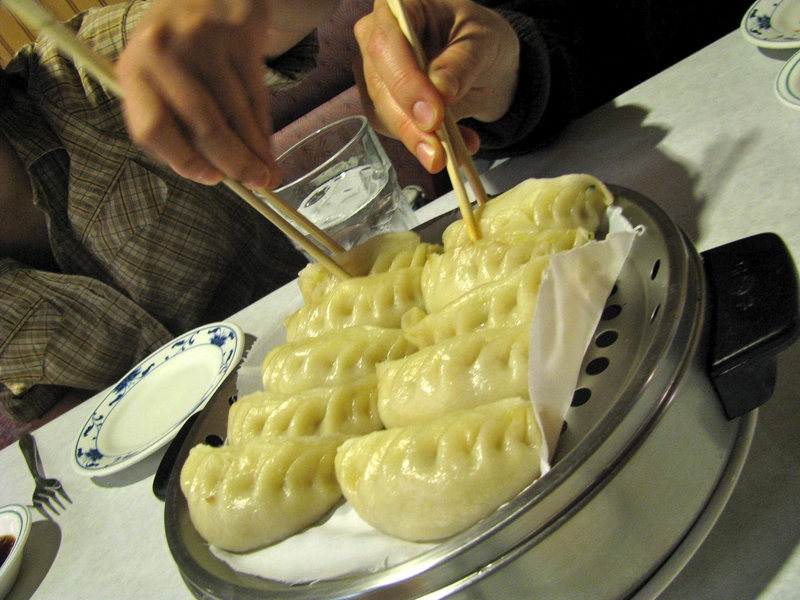 The dumplings are available steamed and boiled. On the advice of our server we opted for the steamed. 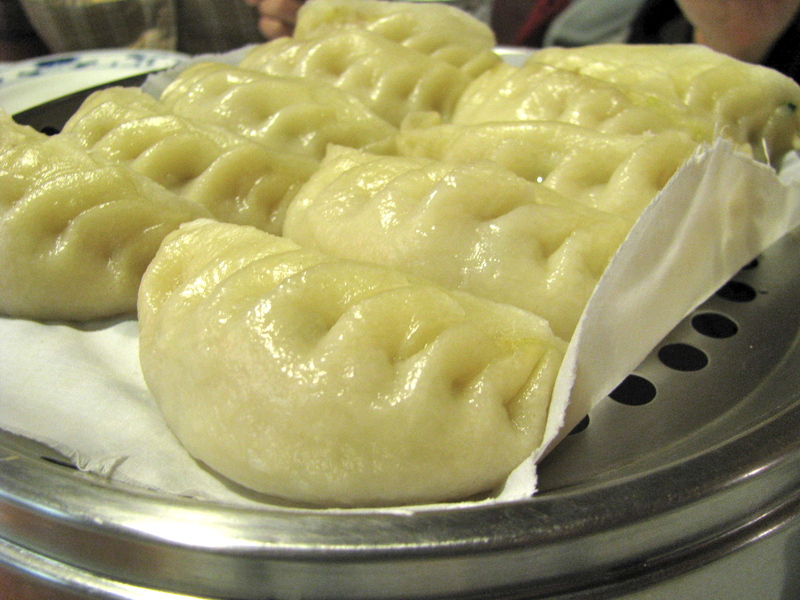 The dumplings were large, and the dough on the thicker side, but both the filling and the dough were obviously freshly made. The filling was pork with vegetables and was fragrant with ginger and with flecks of scallion. My understanding from the menu is that the boiled dumplings have a thinner skin and there are 15 in the serving. 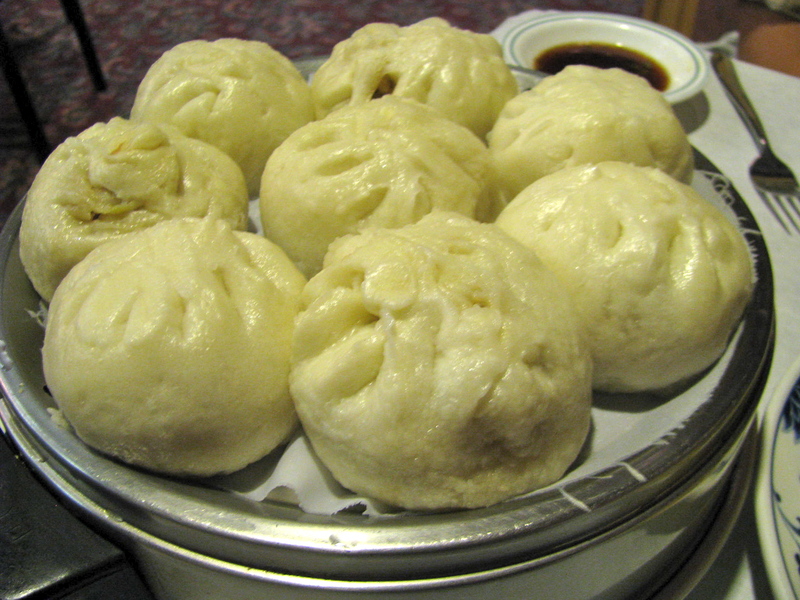 The same filling is used for the pork buns. As you can see the portion size for both is very generous and certainly good for sharing. We wanted to try the noodles and opted for zha jhang myun – hand made noodles with chopped vegetables, pork and shrimp in black bean sauce. The black bean sauce had more of a fermented smoky flavor than the store bought versions – it was pure umami. 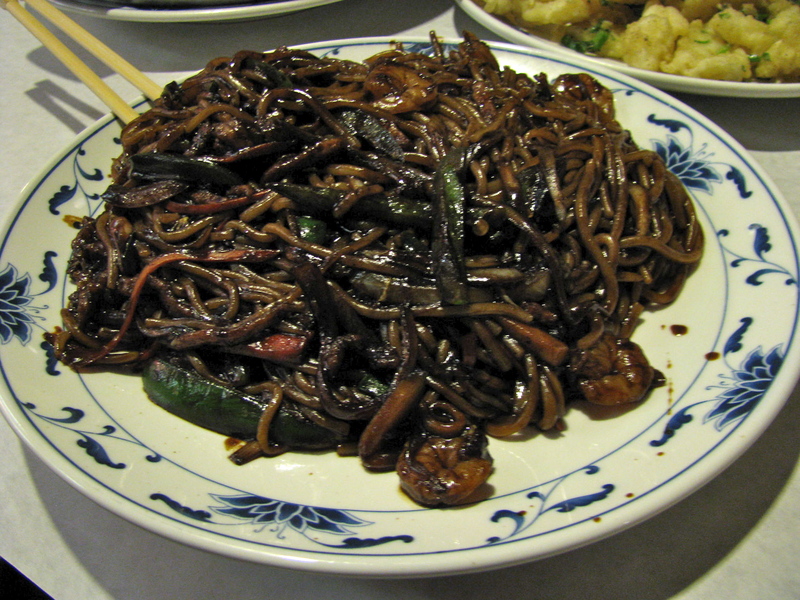 The texture of the hand made noodles was good, but the dominance of the black bean sauce made it hard to discern their flavor. 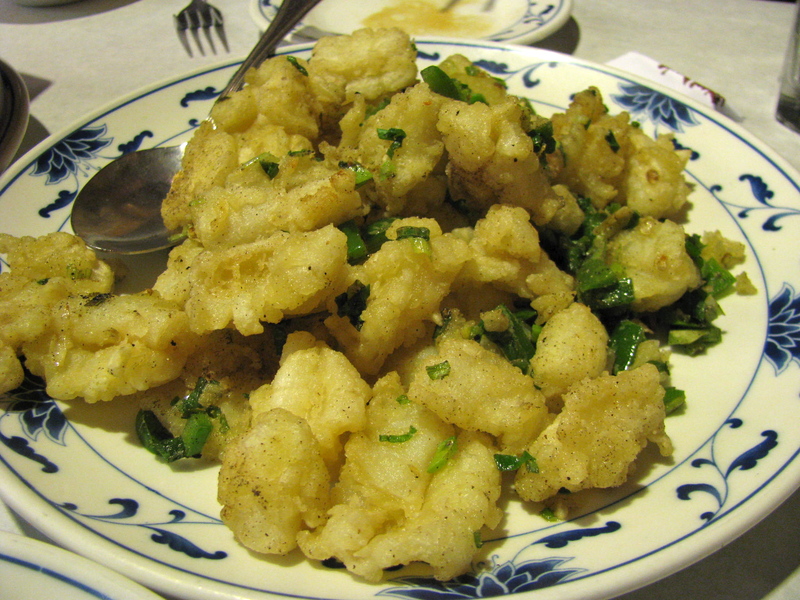 Salt and pepper crispy squid is one of our favorite dishes at Yau’s and we decided to order it for the sake of comparison (and because we can’t resist crispy squid). They were more battered and crunchy than Yau’s and were utterly addictive. 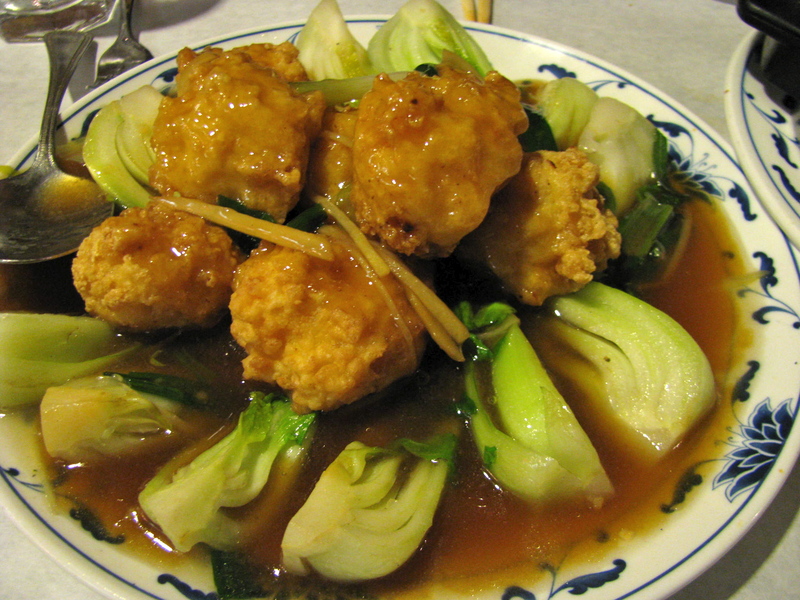 The last dish we tried were the crispy tofu balls with bok choi and ginger and garlic sauce. The tofu balls (which contained shrimp as well) were really good and a pleasant variation on the usual tofu preparations. While the outside was crispy the inside was deceptively light and moist. Perhaps a dish that could win over tofu skeptics. Poong Mei has enough range in its menu to please both fans of American Chinese food and more intrepid diners with everything from sweet and sour chicken to boiled pork feet, sea cucumber and jelly fish.